In the fall of 2010, a grant of $36,000 allowed Portland Community College Library to purchase and place on reserve a copy of every required text at one of its campuses. A smaller college â€œcenterâ€ also placed all required texts on reserve. The program was very popular with students and parts of the reserve collection received heavy use. Compared to the previous fall term, overall use of reserves at the Cascade Campus library rose 35%, and the Southeast Center collection saw an increase of 110%. However, use of the collection was unevenly distributed, with 26% of the books having more than 11 uses that quarter, but a troubling number (37%) receiving no checkouts at all. An analysis of the data suggests several ways that books with 11 or more uses per quarter could be increased to over 70%. These are to purchase and process books in a timely manner, to adjust loan periods for some items, or to purchase texts only for courses with multiple sections. Use numbers compiled over the following 8 quarters show that textbooks purchased and placed on reserve will be used for several successive terms. “All Textbooks in the library: An experiment with Library Reserves. Last week I read a recent article in Collection Building on user attitudes towards ebooks at Colorado State Univ Library, as well as ebook use. The study was done from May-Dec, 2010, and consisted of a survey of ebook user attitudes, and a check on ebook use. Readers who used an ebook were divided between those who prefer ebooks, those who prefer print, and those who don’t care, 1/3 for each. Half of the users had never used an ebook before their borrowing of one from the Colorado State Library. Most readers used an ebook for an assignment. Because the library launched a ‘Purchase on Demand’ ebook program during the study, the number of ebook titles available rose from 4,475 to 7,942 during the 7 months of the study. Of the entire ebook collection of, 11.6% were ‘browsed’ meaning looked at for less than five minutes, with 7.7% being used more than five minutes. (Totaling 1533 unique titles browsed or more over the 7 months.) Thus, 19.3% of the titles were used at least once in the 7 months, although the number really studied (if you call more than five minutes really studying) is not even 8%. There is the chance that relevant chapters were quickly printed and read on paper, but still, use was fairly low. Although there wasn’t a report specifically on the use of titles used after launching the Purchase on Demand (Patron Driven Aquisitions) program, they acquired 3,467 titles via Purchase on Demand, and only 1533 ebooks received use, so it seems safe to say that ebooks purchased under Patron Driven Aquisitions are not necessarily being used! It makes me wonder why they were requested. I have a hand in the patron-driven acquisitions of print books at Portland Community College, and while we occasionally purchase books where the patron doesn’t bother to pick them up from the holds shelf, that is the exception rather than the rule. I wonder if the Colorado State patrons were given a choice between ebook or print book when they put in their request. Library Material Gifts: Unrecognized Treasure or Trojan Horses? All collection development librarians have found themselves facing the acceptance of materials into the collection that they know will be under-utilized and we’ve also all been in the position of having to turn down material gifts. Donated gift materials are such a fine line for all of us. We want to make sure we do not pass on something that could be a significant addition to our collections but at the same time we’re tryingÂ desperatelyÂ to not be saddled with materials that will have little to no use and end up in storage or potentially being weeded within a decade. Apply the three “w” rule to gift acceptance to give yourself the wriggle room for making your library material gift acceptance or denial. First off and probably most importantly, WHO wants to make the donation/receive the donation? If the person making the donation is a well known public official either within your organization or within your local environment, accept the gift materials graciously. Even when you have twenty other copies lurking in various places within your library, accept these materials. Annotate the notes on the records for the copies currently available or replace current copies available with the donated titles and make it clear these material were provided by distinguished person X. It is not unheard of for a long time distinguished donor of library materials to follow up with a monetary donation and orÂ bequeath to your library. At academic institutions this situation can be applied to prominent and distinguished faculty and administrators. There is also a corollary to this type of library material gift acceptance. If a prominent and distinguished faculty, administrator, or public official wants your library to accept a particular material gift, then accept it. Acceptance does not have to mean retaining in the collection. You can still make your local decisions regarding the condition of the material received and/or number of copies held locally or within your consortium. For the material that shows up unannounced and unsolicited, feel free to reject readily. You are under no obligation to add library material just because someone has taken the time to send it in your direction. Secondly, consider WHAT is being donated as potential library material. Sometimes that quirky phone call you receive from the timid voice on the other end of the phone line is worth following up on and investigating. If possible, ask all cold call donors to provide you with a list of material they are considering donating. People with material worth personal interest will take the time to do this and you can avoid accepting the gift at this point if a list is not provided. People not willing to make lists have already boxed up the material and have made a mental break with it and just want to move it out of their space now. Seven out of ten times, the person will make you a basic list, author title of what they want to donate in part because they feel a connection to these resources and want them to go to a good home. The list gives you the ability to either spot check and/or go through the entire collection in a remote way to see how much you would want to accept. If the person calling with the library material donation sounds particularly frail but the person has an interesting story to tell of their collection or due to a connection to a particular department or professor, offer to go to them to review the material being offered. Yes, this takes some time but this is where the treasure is found and how special collections get built. Again, the unsolicited library material donations that show up at your desk for the most part are not things you will want to add. However, every now and again, there are things of interest that appear this way so always open up these packages to give a cursory review. Lastly, consider WHERE the library material gift is located. Is it a departmental library that is being abandoned on your campus or within your local government? If so, taking a cursory look at what is there is not difficult or too terribly time consuming. A good rule of thumb is the fifty mile radius. Is this material gift located within fifty miles of your library; usually, then it is not a problem for retrieval or acceptance. For gifts residing more than fifty miles away, the decisions regarding WHO and WHAT may over-ride the location or need to pay for shipping. In which case, you work out how best to delivery the material to your processing units. Most call-in donors are willing to delivery their collections to you and it is always best to state upfront that you do not have a policy for picking up gift material early in your conversation. One last caveat, it is also good to relate to any given donor that since their library material donation was unexpected and potentially of a large size, that the material will not be processed or added to the collection immediately upon acceptance. This allows you any extra time to review duplicate copies for retention, determine the best location for the material, and work into processing queues or quotas in a thoughtful and strategic way. There has been quite a bit of library news over the past five years about libraries stopping the acceptance of library material donations but we all know that it is impossible to not accept some library material donations. In all honestly, the best any library can do is to minimize the amount of effort that goes into accepting library material donations. By applying the three “w’s” of ready evaluation to each donation call, you can speed up both the decision making process and material donation process. Stanley Slote devoted much of his career to studying library weeding, and methods of doing so. His book Weeding Library Collections (the 4th edition came out in 1997) summarizes these nicely. Sloteâ€™s own research showed that the amount of time since an item was last used is the best indicator of whether it will ever be used again. Iâ€™ll say that another way: The longer it has been since an item was checked out, the more likely it is that it will never be checked out again. With the data in computerized Integrated Library Systems, it is usually easy to run a list of items that have been in the collection at least X years . I suggest starting with five, and have not circulated for the last Y years. I suggest starting with five again. Give me a list of books that have been in the collection at least FIVE years, and which have not circulated for at least FIVE years. Get the title, call number, location and status of the items. Slote says to just send a circulation worker into the stacks, go get the items on this list and withdraw them. Iâ€™m not crazy about that, partially because of local authors and history, and other things that your library just should have. Instead, send your lowest-paid COMPETENT circulation worker into the stacks to tip down the books on the list. (Like circulation workers in training do. They take a cart of books to shelf, and put them on the shelf tipped down on thefore-edge. The trainer then goes by and sees if the books were shelved correctly.) For books not where the catalog things they are, have the worker write â€˜NOSâ€™ (not on shelf) on the list. Technical Services can then change those to MISSING status, or just withdraw the item, whichever applies best. In this case, the librarian in charge of the weeding (or that section of the collection) goes by with a cart, looking ONLY at the tipped books. If the book isnâ€™t worth keeping, it goes on the cart. If it should be kept, it is just returned upright. If it REALLY should be kept, the librarian takes it to the circulation desk, checks it out and then checks it in again. That way the book is â€˜safeâ€™ for another five years. Set aside a section of the shelf for the tipped books that should be repaired/reordered/moved to another part of the collection. But mostly, you just fill those carts. This goes FAST! And even if you miss a few books on condition, etc. you are still improving the collection, and doing it efficiently. Naturally, academic libraries can use this method to place an item into storage, rather than weeding. I think the â€˜shelf timeâ€™ method is better than C.R.E.W. because it reflects how your patrons at your library use the collection, and it is faster. Certainly, if you spot a hopelessly out-of-date computer title, or one in filthy condition, weed it as well, but the â€˜shelf timeâ€™ method eliminates the tedious title-by-title weeding process. Really? Any weeding at all? Of course, you need a method to weed properly. The problem is, too many of us were never taught the right method. 1. It relies on someone elseâ€™s idea of what your collection should be like- not what your libraryâ€™s readers want. 2. There has never (to my knowledge) been any sort of study to show if weeding by the CREW method makes for a better, more responsive collection. It â€˜sounds rightâ€™, but we donâ€™t know if it is right. These are cute, but Iâ€™m uneasy about UGLY and ELSEWHERE. I see people reading all sorts of ugly books. I think ugly bothers librarians more than it does readers. I especially dislike weeding an item that continues to get use simply on condition. If the reader doesnâ€™t mind condition, why should the librarian? Next time: If CREW ainâ€™t right, what is? Brewster Kahle, founder of the Internet Archive, will present the webinar “Universal Access to All Knowledge” on September 5, 2012. The presentation is sponsored by the Association for Library Collections & Technical Services (ALCTS). Together with his wife, Mary Austin, Mr. Kahle started The Kahle/Austin Foundation, which supports the Internet Archive along with other non-profit organizations with similar goals. Additionally, Mr. Kahle is the founder of Open Content Alliance, a group of organizations contributing to a permanent, publicly accessible archive of digitized texts. There is a dysfunctional and codependent relationship going on in libraryland. (No! Not ebooks!) I’m looking at you, print books! We’ve shacked up with print books for so long, everybody thinks it’s a common law marriage. And still we won’t admit that this is a “books who hate librarians and the librarians who love them” relationship. Denial. First of all, our lover turns out to be a hoarder. A&E show got nothing on this loony. Did you ever think maybe there are enough books? How about throwing something way? It’s bad enough that the collection grows like a cancer with what you’ve forced us to buy, but then you get your lunatic relatives to call us up as well: “I’ve got a garage full of textbooks on accounting from the 1950s and 60s. I’d like the library to have them.” Uh uh, Jack. Then, the whole family is trying to lay a guilt trip on anybody who suggests that something has to go. OMG! What about the cultural record! Secondly, what we do have won’t stand up to a good reading. Oh, sure, try to preserve this stuff that starts falling apart after 3 uses. I think HarperCollins was being generous with 26! No chance replacing it because the stupid thing has gone out of print. OUT OF PRINT! What the hell is that? You end up borrowing another copy and tipping in a bunch of tacky looking photocopied pages. Hey book! Why don’t you just send all your pages in a box? Then there’s the lack of standard format. Try organizing a library with all the wildly different sizes that Mr. Print Book comes in. Sometimes we end up with the “over there in the BIG area for no good reason” collection. Don’t even talk to me about those 6-foot tall book nutcases. Sometimes we just say, “screw it!” and cram stuff on the shelf any which way…fore edge down–ripping the cover right off at the spine. Whatever. Who cares? We have not even addressed the question of language. It’s like everybody has a different word for EVERYTHING! How are we supposed to be able to read all this stuff? Some books are even right to left. Back to front. Here’s a good one. You’ve spent $700 on book and then he says, 9 months later, “there’s a new edition. Everything in the old edition is out of date.” Here’s the thing though. You checked. There are a total of 11 word changes and 7 punctuation changes. RIIIIGHT. New edition. $900 this time. This has a variation too: something that looks like a new book altogether, different title, different ISBN, different author even…turns out to be EXACTLY like a book you already have. Word for word. But with all these crazy rantings, don’t even dare bring up separation. He starts screaming and wailing. “No, baby. Please. Don’t leave me! I’ll be better. I promise.” But it’s just the same old story over and over again. Whole bloody family ought to go in for therapy. That’s all I’m saying. Or maybe it’s time to think about saving yourself. Get out of this relationship altogether. He’s never going to change. Instead of immediately posting a frustrated message to an e-discussion list about the problem or concern, what if we contacted the representative that we work with from the provider and asked questions? This could be an account representative or a technical support person. Ask specific questions regarding the situation and use clear language, for example: â€œWhen I do X, it seems that Y is happening and Iâ€™m trying to achieve Z. Can you walk me through this process so I can see whatâ€™s happening?â€ Be honest with your feelings regarding the situation: â€œIâ€™m finding this situation to be really frustrating, how can we resolve it?â€ â€œYour company X called me out of the blue yesterday, what role should I play in working with you?â€ Â When we indicate that we are willing to work on finding the solution to a specific situation, it goes a long way with reaching a satisfactory outcome. As a profession we are open to being disrupted. This is the essence of reference and patron service in our organizations. However, we tend to react negatively when this same form of disruption occurs from our service/resource providers. Just as we are open to help any constituent engaging with us, we should be open to responding to a resource/service provider. This is not to say that we cannot discourage cold calls but we should be willing to meet and talk with the service/resource provider as a mechanism for providing feedback and concerns about their products and services. It is part of our job to make time and room to be good stewards of the resources and services we are providing. Along these same lines, when we receive an email from a service/resource provider, it should not go entirely ignored. Many of these emails are news items regarding service disruptions or new products and do not require immediate feedback. However, when we do get a message from an account representative or a sales person, we should respond within a reasonable amount of time even if it is to say that the timing of their offer for a visit, a trial, Â and/or for a training session on product X will not work at this time.Â We all dislike it when we feel our emails and attempts to contact someone are not responded to in a reasonable amount of time and we should share this same courtesy back. Lastly, offer to be a beta-tester or to serve on a library advisory group for the service/product provider. Indicate that you feel strongly about the resources being offered and that youâ€™d like to support their on-going development or be able to give input on the cost model being utilized. There are benefits to being in on the ground floor of development and new practices with the resource and service providers such as reduced cost and helping to shape the eventual outcome of the service/resource provided. Community Analysis and Materials Use: Do ‘lifestyles’ result in differing use of public library materials? According to a 1995 study I found Â in my files yesterday, Hazel Davis and Ellen Altman studied public library circulation patterns in 10 different communities, with median household incomes ranging from $15,000 to $77,000. They also compared cities number of college graduates, how lively they were to spend money on pets, electronics, furniture, and sporting goods. Over 8 million circulation records were divided, subtracted, twisted and turned. In the end they found: No real difference. Fiction and AV materials accounted for 2/3 of materials use. Â Fiction is about 70% of circulation. Patterns of use for children were similar. Dewey range circulations? Similar! The authors point out that this doesn’t reflect on total use of the libraries, simply that, whatever demand is placed on a library’s collection, the proportion of materials checked out is astonishingly the same. Is this because libraries tend to buy the same stuff? Or that the public wants the same stuff? And what happens if a library starts changing its acquisitions to reflect those differences in demand that do exist? Â Good questions all, but for the moment, it makes me question the value of ‘Community Analysis’ that I was taught in library school. And they found a line from John Cotton Dana, 1903: Â ‘Like their elders, the children are fond of story books, and select them seventy-four times out of a hundred. Adults read seventy novels to thirty other books.’ The 70% fiction rule seems to be a standard. Is that true in your public library? There is a remarkable artistic meme happening all over the world in recent years which involves using books as the material for constructing works of art. This technique is probably not new at all, but its occurrence has definitely exploded in recent years. 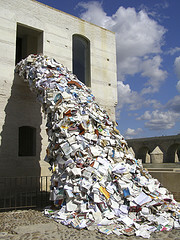 So much so, that I’ve started maintaining a Pinterest board that I call “Books that aren’t books.” These works run the gamut from minute and intimate sculptures carved from the pages of books to massive and menacing art installations. In the later category, Spanish artist Alicia Martin excels. 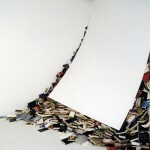 Some of her huge installations involve thousands of books wired to mesh infrastructures inhabiting various urban spaces, some giving the sense of the books spewing (being vomited almost or worse) from buildings. Others have a smaller but no less menacing aspect, like so many books reproducing uncontrollably behind walls to the point of over-population, putting one in mind of Star Trek tribbles. 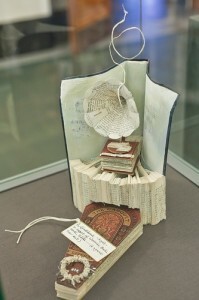 On a smaller but more mysterious scale, in the past year in Edinburgh, Scotland, an anonymous artist began to secretly leave tiny, book-scarved sculptures in various libraries of the city. Each was accompanied by a card with words of praise for libraries and readers: “A gift in support of libraries, books, words, ideasâ€¦” The identity of the artist was never revealed. Even libraries are getting in on the act, creating Christmas trees out of volumes of the National Union Catalog, and reference desks from stacked books. At my own university, an art student constructed an installation right outside our art library of books he got from the public library – skewered on metal cables. The artworks themselves are beautiful and intriguing, but I am more fascinated by the sociology of the phenomenon. What does it all mean? Why is it happening now? Two things I think it suggests. One is a perceived and an actual surplus of books. None of these works could be created without access to large numbers of otherwise unwanted books. The one case I know of, the books came from a library surplus that was headed for the recycling bin. I’m sure many of the other artists got their materials from libraries or book dealers. Public libraries weed their collections regularly to maintain a current and circulating stock. Many large academic libraries, which have heretofore maintained collections seemingly in perpetuity, have begun to draw down their print collections to rely on shared print repositories or digital surrogates. A second explanation, I think, is that people feel guilty about that surplus. Why are we throwing away books? Aren’t books a sacred commodity? Faced with that sense of guilt, those with an artistic inclination want to make something else useful out of these objects, if they aren’t going to function as books any longer. Sometimes, it’s as though the art is commenting on that duel relationship of surplus and guilt. Books carved into coffins! 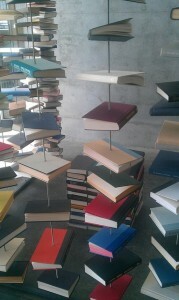 Books pinned onto cables. Books ejected through a window! These are interesting times we live in. The time of the Internet. The time of the Kindle, Nook, and iPad. Is there still a place for the physical book? We don’t know. And some of us are a little disturbed by the uncertainty.